Epic Images is please to present the 2006 Epic Images of Cycling calendar. This calendar showcases the passion and skill of photographer Jonathan Devich in this distinctive collection of photographs taken at the Tour de France. 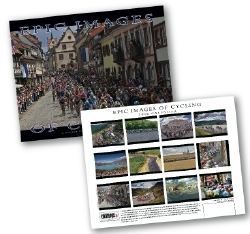 A great stocking stuffer, the 2006 Epic Images calendar showcases thirteen full-color cycling photographs in oversized formats featuring large daily planning boxes for appointments. The calendar features international holidays and descriptive text. Retailing at $12.99 U.S. calendars are available online at www.epicimages.us, and at major bike shops throughout the United States. Jonathan Devich is currently on staff for Cyclingnews.com and his photographs have been published in the United States, Canada, France, England, Germany, Italy, Holland, Belgium, Australia, New Zealand, and South Africa. His work has appeared in Sports Illustrated, Outside, The New York Times, The San Francisco Chronicle, Velonews, and Bicycling, to name a few.